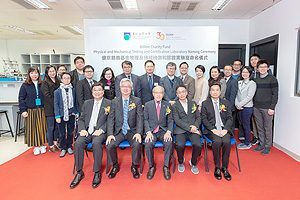 The Physical and Mechanical Testing and Certification Laboratory has been named Billion Charity Fund Physical and Mechanical Testing and Certification in recognition of the Billion Charity Fund Limited’s generous donation of HK$3 million towards the development of the University’s new Jockey Club Institute of Healthcare. The Billion Charity Fund Physical and Mechanical Testing and Certification Laboratory is located at the 10/F of the OUHK’s Jockey Club Campus. It is one of teaching laboratories to serve the testing and certification programme and is equipped with the testing equipment for (1) material testing; (2) acoustic testing; (3) flammability testing; (4) toys and children’s product testing; and (5) garments and apparel testing. The equipment of the 3D printers and computer numerical controlled machine for fabricating the testing machine prototype are also provided in Laboratory. The laboratory was assessed with reference to the ISO/IEC 17025: 2017 by Hong Kong Accreditation Service (HKAS) on December 2019.